It’s probably just me, but the colors in this look remind me of birthdays and ice cream. I gotta tell you – I miss all those birthday parties I had (and went to) when I was really young (like 3-10! ), those were always fun. My favorite kind of birthday cake is ICE CREAM CAKE! I also die for my boyfriend’s mom’s carrot cake, which she makes for everyone’s birthday. DELISH! What’s your favorite kind of cake? Oh, and I totally got eyeshadow base on my BROW, which I didn’t notice was so apparent until after photos – blah blah, I fixed it after, you know the drill! P.S. — Big happy birthday to the lovely Karen @ Makeup and Beauty Blog! For eyes, start by applying Smudgeproof as your eyeshadow base all over the eye area with the 249. Using the 239, apply Juxt eyeshadow on the lower two-thirds of the lid. 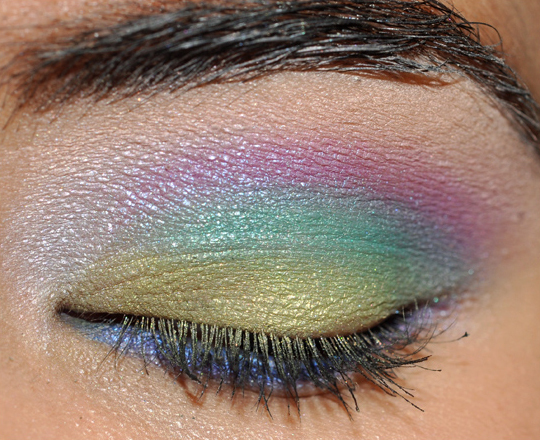 Lightly place Aquadisiac eyeshadow on the crease 239. Next, apply Stars ‘n Rockets eyeshadow above the crease with the 239, lightly blending onto the outer lid. Blend Orb eyeshadow with the crease shade and highlight the brow bone. Bring everything together by applying #15 aqua eyes on the lower lash line. Finish by sweeping lashes with Opulash mascara. For cheeks, apply Romeo & Juliet blush on the apples of the cheeks and sweep upwards towards the temple with the 116. For lips, apply Capricious lipstick first, and then layer Cultured lipglass for a complementing lip. this is awesome! And yes, I totally understand– finals are killer! Actually, I have a final paper due today that I should be working on RIGHT NOW but I am procrastinating on this site…! You can do it!! Just think… all that’s left, then you’re DONE! i’m actually playing with makeup whilst listening to a finance lecture. I love this look! Congrats on being done with school for a while. I’ve been out of college for 5 years now and I still have nightmares about finals! Thank you!! 🙂 LOL, they are a tough period to go through! love the colors you used, it looks so pretty on you! I love the blending on this…it makes me think of Happy, lol! WOW! I really love this look! You’re so creative Christine! I wonder how this would look on my dark skintone. Thank you, Aisha! I bet it would POP! something fierce on your skin tone! this really looks like icecream. yummy! but i need that stars&Rockets eyeshadow. you used it a few times recently and it looks so nice. Thanks, Mora! OMG, Stars ‘n Rockets is a must!! Love it! Love it, love it, love it. You inspire me. O-M-G! I just fell in love! This look is so nice! MmMm…I think I NEED juxt and an ice-cream right now xD My favourite cakes are those with fresh fruit on top, maybe with a puff-pastry base…Yum! Absolutelu beautiful! You look great in this makeup – so sweet and delicate 🙂 I love the blush! My fave cake is yellow cake with chocolate icing-yummy! Hmm…that would be an interesting makeup look lol! You look incredibley gorgeous as always! I love this look! I’m definitely trying it this weekend. Oooo I really like this! My favourite kind of cake is a tie between cherry chunk and black forest. Can you tell I like cherries? Oh, and there’s this one cake I made for mother’s day once. It’s a sort of sponge cake (but not quite. It’s white cake, it’s just really light), and you ice it with whipped cream and cream cheese icing and top with strawberries. Yum! Haha, yes, definitely sounds like you are a cherry fan 😉 Sounds delicious! That is such a pretty look! I may just have to buy all the eye shadows you use so that I can recreate! Woah, this is really beautiful. congrats on finishing your finals and being free, I just walked out of my final final (haha) at 10pm yesterday as well so I feel you on that one! This look is Fab on you! This look is SOOOOO pretty!!!! Congrats on the summer vacation that will be so nice! This is one of my fav looks from you I totally love it. HOLY CRAP!!! Christine this is AWESOME! I haven’t seen you do a look like this before and you were right on the money with your description! It’s the FIRST thing I thought when I saw this! 🙂 And so easy with the application and only a few colors but it looks WAY more than the list of products you used (in a good way, not in a Tammy Faye way). I really like that it’s pastel without looking 80’s. It also makes me want cupcakes with sprinkles! AARHH! haha! you’re welcome – sorry if i was a little over-excited 😛 if it helps at all, had i seen you in person i would have also yelled “holy crap!” right in your face… lol! it looks great! I wasn’t planning on it, but I am due a trip to MAC, so maybe I’ll buy the ones I’m missing… but knowing me, it will irk me to have some in old jars and others in new jars in the same photo. Argh! By the by, what on earth are Full Force Violet, Magenta Madness, and Neo Orange doing at counters? Those are some tough pigments to work with, but really? REALLY? You hold back Antique Green to freestanding stores only but Neo Orange goes to counters and stores……. I know… I was surprised that any mattes made it to counters – Let alone those neons that MAC labels as not safe for the eyes or the lips (they’re cool under a black light though)! I have had a lot of luck applying neons and other mattes on top of a white eye pencil. They’re still ashy-ish in texture, but over a white kohl they’ll stick to the skin well and keep almost all of their original color. I was also surprised to see so many golds at counters (nothing against golds, I don’t want you beating me up – Hehe) but I would have liked to have seen some other colors (or maybe even some glitters, if they’re going to launch stuff that isn’t eye safe anyway). MAC really needs a good green pigment, they don’t have one and I’d like to see it – Same with blue for that matter. I miss the old “blue” and “green” pigments from years back. I just can’t fathom how neons, given that they’re “unsafe” for what seems like everywhere except the body… would be on counter, LOL! I loveee Golder’s Green (old LE). So pretty! And I die for True Chatreuse & Chartreuse. I’d love to see MAC put out some new pigments and do some softer shimmer shades, too – like a satin finish pigment! Not quite matte but not super frosty! Me too! It’d just be nice – it seems like there aren’t enough in-between textures. But I am a pigment fiend… haha. Thanks christine. 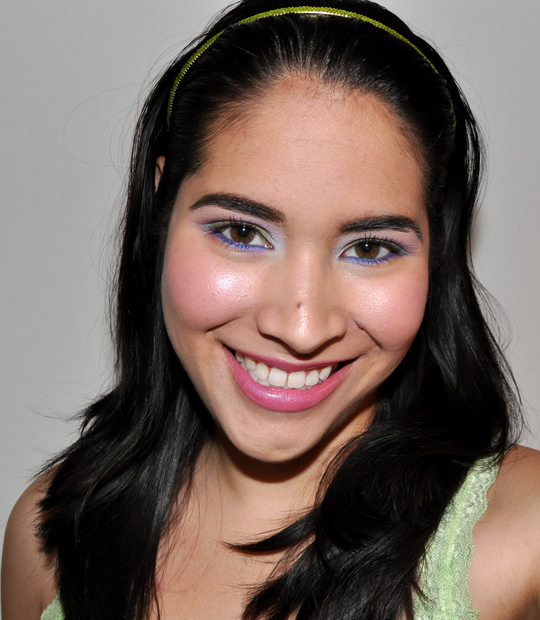 did you know this look can be duped with the alice in wonderland book of shadows? I am gonna save myself some money and use it to wear this look to work friday! I love the colors, bright and playful! My favorite cake is also ice cream cake. I had one for the first time on my 27th birthday (I feel so old!) last week (June 2nd) it was really good!! This is sooo right up my alley! Love this! this is so pretty, I’m going to a friend of mine’s daughters first birthday on sunday, and i think i’m going to wear this look! The class was law for business students, but since I’m also a law student, it was like first year law school all over again. So, luckily, not too difficult for me since I had learned it in even more detail before, lol! i love that you are always smiling! Wauw, it’s amazing, love the eyes! how relaxing it is at mom’s place isnt it??? Mom always treats you well, I bet! This look is so cute and you look beautiful! They look so different – from the name to the bottle… Is yours super thin in consistency? I didn’t see anything on the U.S. site that looked like the picture you showed me, though. It has dimenthicone in it, not super high in the ingredient list, but high enough that I think that might be why 🙁 I am mostly recovered now, but I got about 6-7 big painful bump pimples. I wanted to cry, lol! Crazy! They gotta be totally different products for sure. It’s very thin, runny almost. Like a liquid. I seem to react really poorly to dimethicone! I think a lot of my acne is food, hormone, or stress-related since it doesn’t seem to get better over time as I try new products, even though I *do* stick with a new routine for 6-8 weeks. Aww 😛 Thank you, Crystal! Yay for being in your face and wearing makeup to your exam 😉 I love this! Colors coordinate so beautifully. I think if I do it sometime soon I’ll use Aquavert instead of Juxt because the warmth of Juxt throws me off a little – but it still works for sure. Funny, Capricious is my mom’s favorite lipstick, but since she doesn’t have a MAC counter near her I bring her a tube every Thanksgiving – but have never paid the color much attention myself! I don’t know why…obviously Cultured changes it up quite a bit but it still looks very pretty here. I know! I actually managed to do my makeup before the sun went down, LOL! Capricious was one of my first lipsticks, I think. Crazy how time flies! It looks great on you! Well done on finishing finals! Oooh, that sounds so pretty! This is simply an amazing look! One of my very favorites that you’ve done! looks lovely, & my favourite cake is chocolate fudge with ice cream! Wow. Just wow. That is one of the best looks I’ve seen you do ever. And that’s saying a lot since you make great looks all the time. As for cake, I love yellow cake with lots of buttercream frosting. Mmmmm. Wow 😀 Thank you so much, Trisha! I am a big fan of yellow cake, too! you always have the best color combos! enjoy your summer off…feels great to be done, even if only for a few months…trust me I understand…just hard to adjust to not having homework to do! I almost feel guilty for not studying…then I remember I don’t have to!!! hey christine… i LOVE this look! you really do well with colors! would shimmermoss work instead of aquadisiac and do know any shadows that could replace the lower lash liner. thanks! my favorite cake is cheesecake! especially the red velvet cheesecake from cheesecake factory. amazing! Thank you so much! I haven’t braved the Red Velvet Cheesecake at the Cheesecake Factory – I saw the calorie count and couldn’t dare, lol! You could definitely try Shimmermoss instead 🙂 Maybe UD Deviant or Flipside? RED VELVET CHEESECAKE!?!??!!?? tell me this isn’t true???!!! That makes me happy I don’t live in any reasonable driveable distance from one… reasonable right?! lol… hmmmm how far would I drive to eat this!!! christine i love this look! This look is gorgeous! 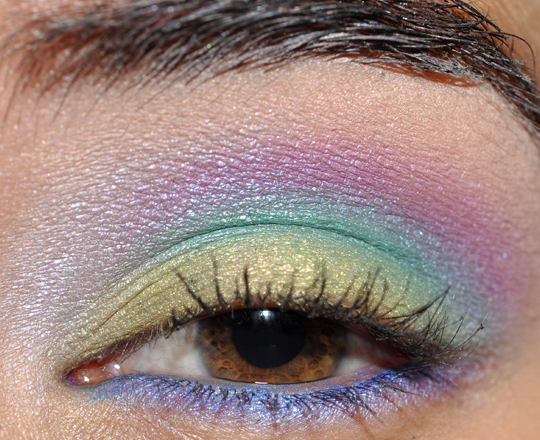 Aquadisiac is one of my favorite eyeshadows, and the pastel color theme is so dreamy. OMG! I love everything about this look! 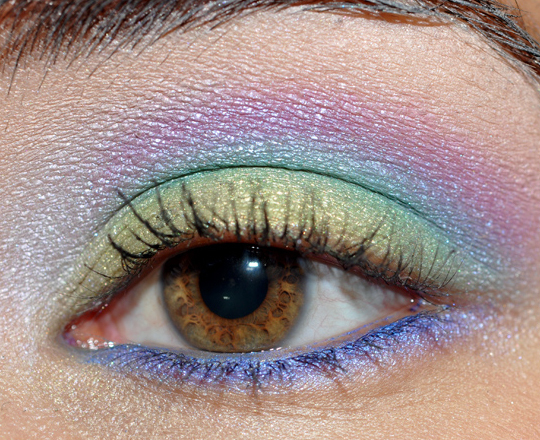 The placement of the eyeshadow is so different from your other colorful looks, and the colors go so well together. The lips are just perfect. You look stunning in those pics. LOVE LOVE LOVE! Oh, and my favorite cakes are red velvet and carrot cake, btw. And now I suddenly got really, really hungry. lol. LOL! You & me both! You must have turned heads while writing your finals! The colours are so beautiful. Though it’s something I’m not quite that adventurous to try, they certainly look very becoming on you. Good job and congratulations! Summer feels great. Very cute! I’ve got to try this! You’re like a little rainbow of loveliness! I love this look! 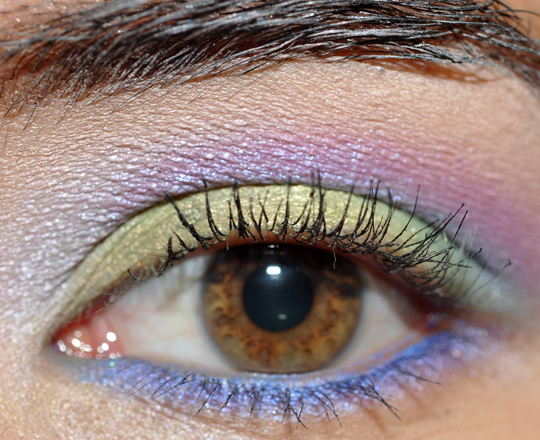 I really like when you play around with where you place the colors on your lid. Ironically, I’ve totally done this same color placement before, LOL! personally i like this better as you haven’t gone as high on your browbone! i can never work eyeshadows into my crease properly, it either goes too high or the line looks wonky and not round or following the shape of my eye. Hahaha I KNEW it was familiar! I go through temptalias look gallery quite often, and you tend to gravitate towards putting the colors down vertically, the last time I remember you doing a horizontal look was with the stila jewel eye palette? I always find it makes my eyes look droopier! oh Christine, you’re too funny. do you get lots of compliments when you show up in class with flawless makeup like this? i’ve found that college lecture halls won’t exactly become known for flattering makeup looks anytime soon. my fave cake is strawberry cheesecake, although for my birthday this year my sister made me a chocolate cake with vanilla pudding with coconut on top and coconut mixed into everything (erm, can you tell I’m not a baker myself?) that was absolutely mouth-watering. The cake your sister made sounds so yummy! Christine,this look makes your TOP TEN LOOKS EVER!!!!! It makes me want to eat this make up,incredibly beautiful! And congrats with finishing the school for now! Sleep more and rest as much as you can! Ooh I love this look Christine! it reminds me of the sugar sweet collection from mac or just brightly decorated cakes and cupcakes!! Awww… you’re so pretty Christine :). Appreciate all of your heart work. Please always maintain your honesty to us when you review products and contain giving informative advice. So many people change after they become well known and I respect the fact that you haven’t done so. Have you ever tried birthday cake ice cream? Basically the same thing as an ice cream birthday cake, but in just ice cream form. My 5 year old’s FAVORITE! Thanks, Mandy! Yep, I have — it’s SO sweet, I can only take a few bites, lol! Oh I LOVE this look! You’ve been popping out some amazing looks all week and this is now my second fave of any of the looks I’ve seen since reading Temptalia. It just looks so airy and magical. Is that weird to say?? I love 15L -I’ve been wanting it for months but I just feel like I have too many liners to go splurging on another. Congrats on finishing your final!! Do you have some amazing plans for summer? You should take a nice, long vacation since it’s been all work and no play for so long! Yay for no school! Crazy! But in a good way – glad you like them 🙂 LOL, I can barely close my eyeliner drawer right now, so I know how you feel. Argh! No plans. The only vacation I’ll take is the one that you don’t even know I’m on 😉 If you know I’m on vacation, that means I’m not doing my job!! LOL. WOW. Okay, I need Stars & Rockets! And the cheeks here are super pretty! Thanks, Nora! 🙂 I lurveee Stars ‘n Rockets! You know wat, I love putting on my fav makeup to final exam too! !~ haha.. Thanks, Jessica! Yep, both are permanent 🙂 There’s nothing quite like it, but you could use Deviant instead. It reminds me of what a mermaid’s eyes would look like. I don’t see cake. Maybe cuz I’m not hungry.lol Beautiful nonetheless!!! do you think this would look okay with super pale cool skin? 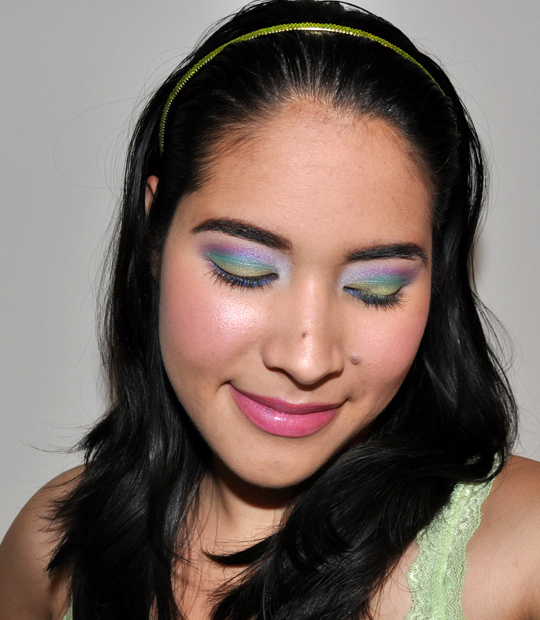 this is such a fun pastel look! So pretty!!! Pastels are wonderful!! Very lovely Christine. I love the colors you used from eyeshadows to lipstick it really reminds me of ice cream and cakes…yummy! wow Christine i looove this look!! how do u come up with all these beautiful looks?! Thank you, Abby! LOL, I guess I just look at everything as an experimentation! I try not to try, too. I find if I try hard to be creative, it doesn’t work out so well – better to let it just come when it does! I think is is my fav look of yours! You look beautiful and super happy! Aww, thanks a lot, Allison! Lovely look…got some fun inspiration here. Aw! Happy birthday, Jennifer 🙂 Enjoy yourself! Lots of June babies! Pretty look. Reminds me of going to get rainbow sherbet as a child. I was reading your entry and saw where you were saying Happy Birthday to Karen with the blog called Makupandbeautyblog.com. I was surprised because mine is called makeupandbeautydiary.com. I went to her blog and love it:) Thanks so much! the funny thing is, i did eat a ice cream birthday cake yesterday at a party! This is a soft 80s look–in a good way. Kinda retro. this look does remind me of ice cream. it’s so pretty! Though I’m not as into the purple under the eye, I think the eyeshadow combo you’ve got here is beautiful and very summery – makes me think of eating sherbert on a hot summer day! OMG, SO PRETTY! Christine, I really have been loving your looks lately! Congrats on almost being done for the summer, and congrats on the great grade in your stats class! LOL! Aww, enjoy your break, Mandi! So pretty, this look makes me want to try and wear colors. I looove Red Velvet Cake with Cream Crease Frosting, I get one for my birthday on Sunday!!!! Thanks a lot, Gabrielle 😀 YUM! I love this look, the colors go together so so well!! Really funny and sweet! 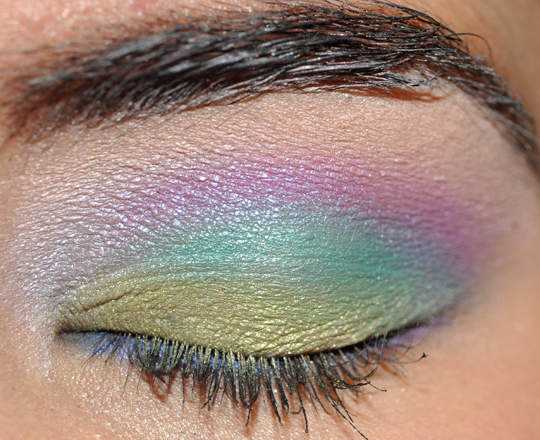 Love the whole face, but I would prefer a more soft pastel green on the lid… I have to search for it because I miss it! Thanks, Fiona! Oh, these were taken wayyy before the exam, lol! Thank you, Mariah! You have a very good eye! I believe I did use Digit on the inner tearduct and Stars ‘n Rockets on the lower lash line! I love it! It’s like a pastel rainbow, or a My Little Pony, or the colors of the walls in my house (pink, lavender, periwinkle). Congrats on your break from school! This is my first summer off in 5 years, and I don’t know what to do with myself! Any plans for your summer off yet? Today is MY birthday and what I wouldn’t do for a delish 31 Flavors Ice Cream Log cake from my past… shoot, I would be happy with a Clown Cone! I love this look! Ice cream cake is the perfect description. Awesome 😀 So glad you tried it, Sum! This is so pretty! Love the eyeshadow colours, but what I love even more is that eyeliner and the lip combo! Gorgeous! Oh wow! It looks great, but i dont like the lips! I love this look it looks so pretty on you, perfect name for it too. oh my, how can you do that! you’re so talented!! Can’t wait to see more awesome looks! I can totally understand that you can’t always wear bright makeup just anywhere, lol!